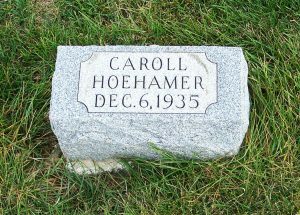 Caroll Joan Hoehamer was the infant daughter of William Andreas Hoehamer Jr (1909-1978) and his wife Alice Luella (Deitsch) Hoehamer (1908-1997). Zion Chatt’s baptism records indicate that Caroll was born on 5 December 1935. Their death and burial records report that she was born on the 6th. 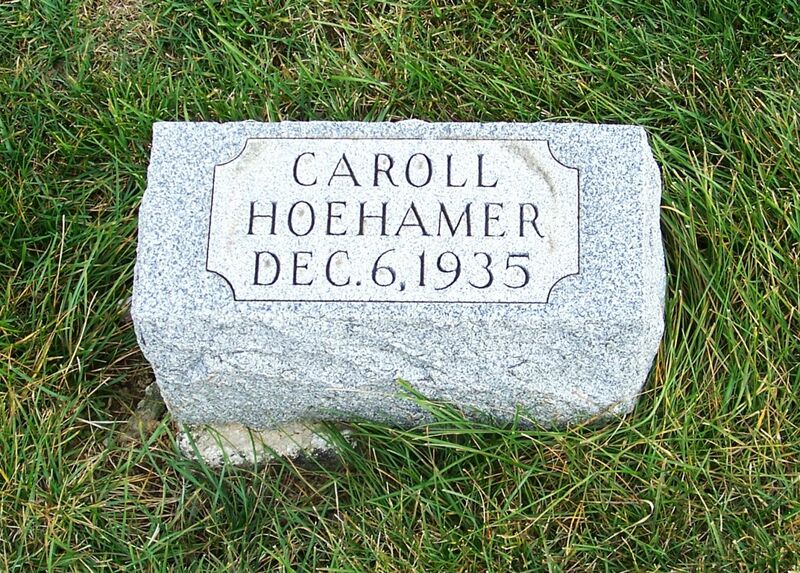 That same death record indicates that she died of a navel hemorrhage on 6 December 1935, when she was only 3 hours old. Caroll was baptized by Zion Chatt’s Rev. Carl Yahl on the 6th with Mrs. John Deitsch serving as her sponsor. Both William and Alice are buried in Resthaven Memorial Gardens, St. Marys, Auglaize County, Ohio. Summit County, Ohio, Marriage Records, 1840-1980, Vol 60, p.25, William Hoehaner & Alice Deitsch, 14 Jan 1930; Ancestry.com. 1940 U.S. Census, Black Creek, Mercer, Ohio, ED 54-1, p.3A, line 37, Willialm J Hockammer; Ancestry.com; NARA microfilm T627, roll 3114.